A short stretch in the woods will lead you into a silent jungle where you will discover your inner self. 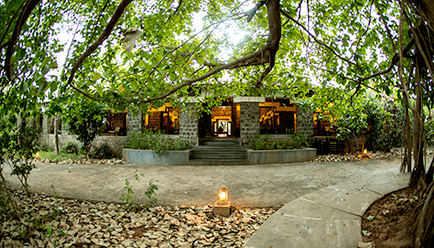 The Bandhav Vilas has earned the reputation of being the perfect getaway for those seeking the best of unblemished wildlife. 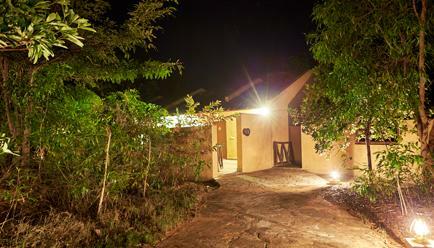 This property offers you the opportunity to live in the lap of nature. The contemporary villas offer you a luxurious blend of comfort and natural exotic ambience that makes your dream vacation a reality. The lodge is environmentally friendly, in harmony with the natural features of the site and accentuates natural light at all facilities. Local knowledge and art were incorporated into the development and the pavilion was built using local labour. 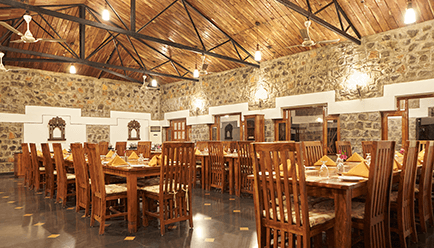 The lodge is rustic and luxurious, with fine cotton and handcrafted furniture. 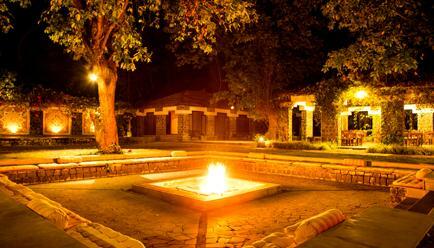 An emerging tourist destination, Madhya Pradesh, combines architectural and natural wonders. The temples of Khajuraho of the 10th century, the masterpiece of the budding Buddhism of Sanchi or the cave paintings of Bhimbetka over 28,000 years old are classified by UNESCO. The state also has 9 national parks and 25 sanctuaries, a quarter of its territory is covered with forests. Madhya Pradesh is renamed "The State of the Tigers", no less than one-fifth of the population of tigers of the Indian subcontinent live here. 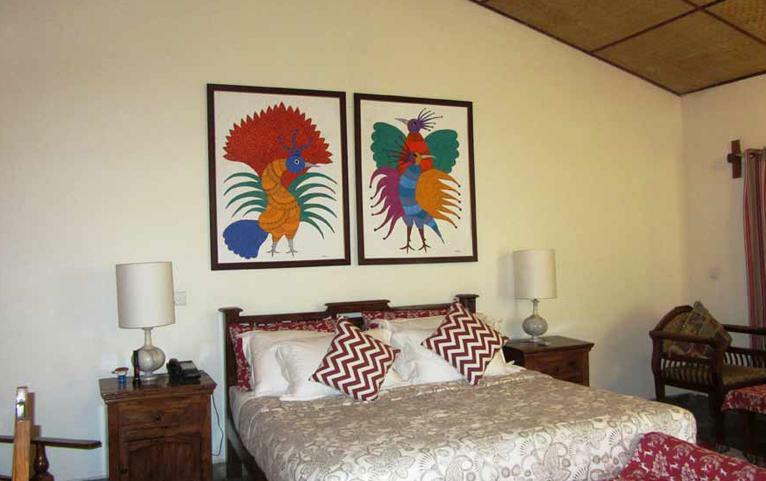 The resort is in the heart of the wild country and in close proximity to the Bandhavgarh National Park. You benefit from an exceptional location, an exceptional team and a naturalist ambience, and the resort’s commitment to conservation and local communities. 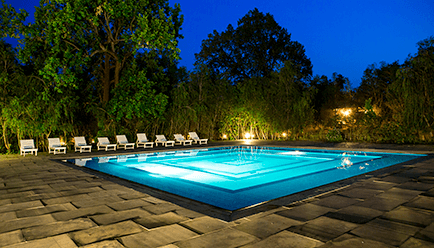 The Jungle Lodge in Bandhavgarh has 20 villas with upscale amenities, spread over a natural forest offering a great atmosphere and privacy. Villa – 100 sq.m: Each villa represents aesthetic elegance and is designed bearing in mind the needs and desires of the modern traveller. 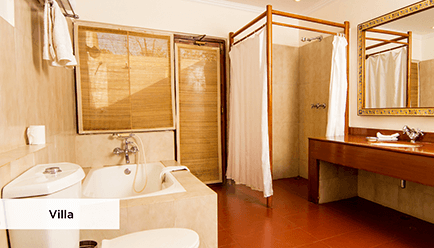 From herbal bath products to a welcoming décor, your room is as inviting as the green pastures around. Maximum Guest Capacity: For the Villa, The maximum room capacity is two adults and one child (aged below 12 years) or 3 adults. See the ‘Extra Guest Policy’ and ‘Child Policy’ for more details. 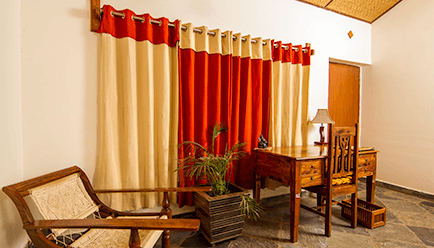 Extra Guest Policy: Where applicable, an extra adult can stay at a surcharge of INR 3000, with an extra bed and the inclusions available in the package, payable directly at the resort. Child Policy: A child (aged between 0-5 years) may stay free of charge. 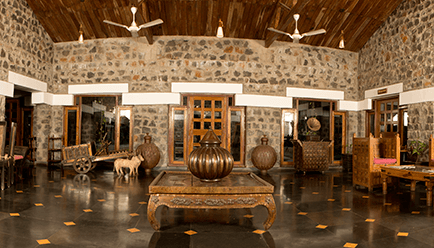 Where applicable, a child aged between 6-12 years may stay at a surcharge of INR 2500, which includes an extra bed and the inclusions available in the package, payable directly to the resort. 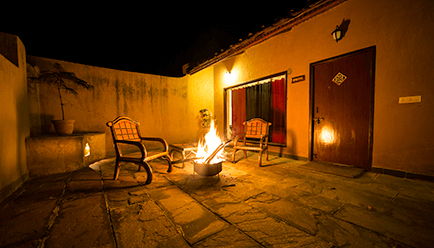 Private courtyard: A stunning courtyard and deck await for you to spend a relaxed evening with friends or loved ones. Library: The resort has a well-stocked library for the bookworms to rewind and relax. Spa: Indulge in an exclusive session on the most popular Aromatherapy. 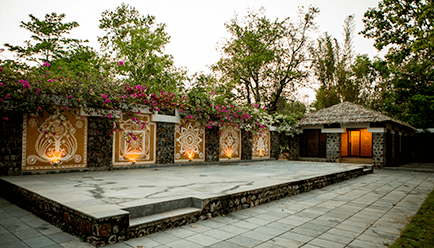 The resort offers one of the best spa services in the region. Other features: The hotel offers a games room, conference hall, business centre, laundry service, 24-hour doctor on call, live entertainment, pickup and transfers, guide service and a library. 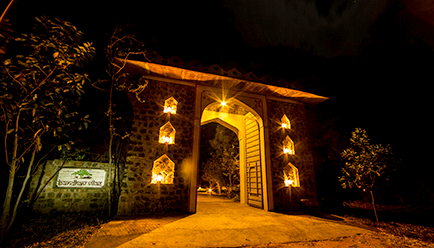 Bandhavgarh is well connected to the major cities in India. The nearest airport is Khajuraho which is a 7-8 hours drive from Bandhavgarh. Bandhavgarh enjoys excellent road connectivity from all major cities across India. The nearest railway station is Umaria. There are daily trains from Delhi to Umaria. Bandhavgarh is about 40 min drive from the railway station.